Which Candidates Are Financing Their Own Campaigns This Year? It takes money to run for office, and when campaign donations come up short, candidates often tap into their own funds. 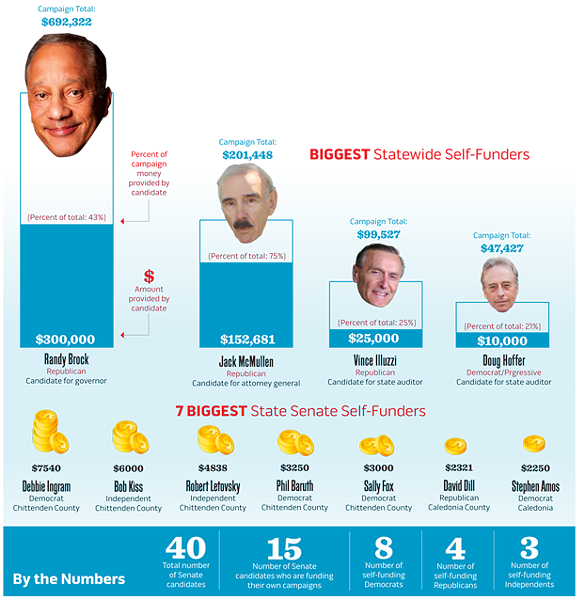 In 2010, Peter Shumlin memorably dipped into his then-$900,000 annual income to loan his gubernatorial campaign $275,000. This year, Shumlin’s Republican challenger, retired Fidelity executive and state Sen. Randy Brock, loaned his campaign $300,000 — 43 percent of all the money he’s taken in. In 2011, Brock reported income totaling $268,000. Sometimes campaign loans are paid back with future contributions, but often wealthy candidates end up “forgiving” the money they loan their campaigns — making them, in essence, high-dollar gifts. That can give well-heeled candidates with money a distinct advantage, which directly affects the demographic makeup of state government. Who else is self-funding their campaigns this year — either with loans or direct contributions? Seven Days analyzed the most recent fundraising reports for candidates running for statewide office and state Senate — the races that require the most money to win. One theme jumped out immediately: Most self-funders are candidates challenging incumbents or those battling for open seats without name recognition or easy access to donations from political action committees, businesses and lobbyists.